The Lotus F1 Team E20 demonstrated its reliability during the second day of testing at Jerez, completing 117 laps as the team continued its initial assessment of the car with Kimi Räikkönen at the wheel. “There was a small issue with damage to the floor this morning when I went off and came back on to the circuit. An edge on a kerb caused the damage and we lost some time as it was repaired. Apart from that it was a good day and we completed some long runs and good mileage. Physically, I felt fine after 117 laps. Conditions were quite windy on track but despite this I got a better feeling from the car. There was a lot of difference between the tyres. We used three compounds, but it was hard to get all of them working with the cooler temperatures today. When the tyres are working we seem to have a good car and I have a positive feeling from this first test. ” said Kimi. Start your engines and get ready to race. Now its your chance to be immersed in the new action-packed racing game featuring Formula One World Champion, Kimi Raikkonen, The ICEMAN. 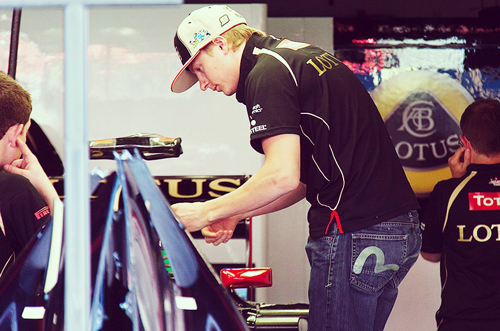 Live Kimi’s racing career virtually across a range of vehicles and locations around the world. The Finnish entertainment media company and the Finnish world-renowned driver will be collaborating on co-branded Angry Birds Space clothing that will be sold through the Angry Birds web shop later this spring. Kimi will also be sporting an Angry Birds design on his team cap during the Formula One season. Angry Birds Space is a brand new game from Rovio, featuring interstellar gameplay ranging from slow-motion puzzles to lightspeed destruction. The Angry Birds have also been transformed into superheroes, including the new character Ice Bird, which will be featured on Kimi's cap. Angry Birds Space arrives on iOS, Android, PC, and Mac on March 22. Kimi Raikkonen, LotusKimi Raikkonen believes the track surface at Montreal should suit the supersoft Pirelli tyres in the Canadian Grand Prix this weekend. Despite struggling in Monaco, eventually finishing in ninth position, the Finn is confident that Lotus can overcome the set-up issues that blighted his weekend and return to form in Canada. "The surface is quite smooth so it won't be so hard for the rear tyres. I don't think it will be the easiest thing because the tyres are pretty soft," he said. He conceded that Lotus will need to do better in Canada if Raikkonen is to fulfil his and the team's potential. "We will try to do things slightly better than before and to get the maximum out of the car, I have to drive as well as I can and hopefully then we will be faster," said Raikkonen. However, the 32-year-old says that Lotus will not be the only team with set-up issues in Canada and that the driver has a key role to play in managing the tyres during the race. "We are probably not the only people to have those, so I think if everybody would know how to fix them then it sounds a simple thing, but it is difficult to get exactly the tyres working and different teams have had different problems in different races," he said. "If you go faster then you will pay a bigger price in the long run so you have to know when to pace yourself and if you are a good driver then you should know," he added. Six races, six winners. Going by the trend and your performance so far, you seem to be the most likely candidate for the next race. How do you rate your winning chances not only in Montreal but in other races as well? Well, I think we do have chances to win a race this year, hopefully it will come soon. We have a good car and so we just need a good weekend to make it all happen. We have been on the podium, and we have had a good pace to fight, so it should be close enough to win, as well. What do you think about the 2012 season so far? Has it been the most exciting that you have participated in and why? It’s been a good year so far. I don’t know yet if it is the most exciting or not – we will see at the end of the season, and see what has happened. So far nobody has been able to dominate. As long as it is like that, it’s impossible to predict how the next race goes. Obviously, that’s good for the fans. There is only one way to drive a F1 car and I have not forgotten it. As I’ve said it before, it feels like I have not been really been away. 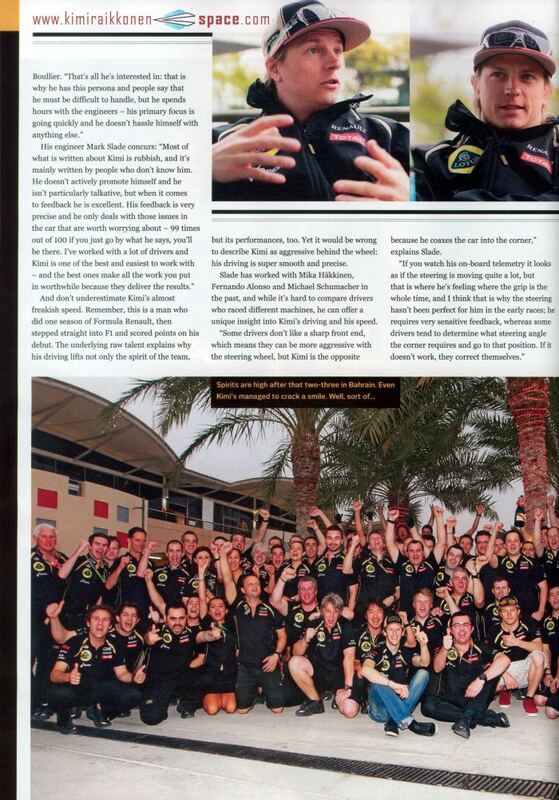 I have no secret – I’m as competitive as I have always been and I’m enjoying the racing and being with Lotus F1 Team. What is your opinion about the so-called ‘tyre lottery’? Michael Schumacher has criticised the tyres saying it’s like driving on raw eggs. I have had to discover and learn the tyres at the beginning of the year, but really I have no issue there. I think that I have adapted well. I think the biggest effect comes with the fuel loads. In the first part of the race it’s really heavy and that is the time, while you have to careful with the tyres. It takes some time to adapt, for sure. In Bahrain and Spain, you were within striking distance of the eventual winners. What extra bit do you think is necessary to win a race? How crucial are qualifying results in this regard? Qualifying is and has always been key but during the race anything can happen. About the extra bit, I don’t know, I think that we just need a clean race that we would start as high on the grid as possible to improve our chances to win a race. Did you expect such an impressive performance (individual and constructor) before the start of the season considering that you were returning after two years and not with a big manufacturer team like Ferrari or McLaren? 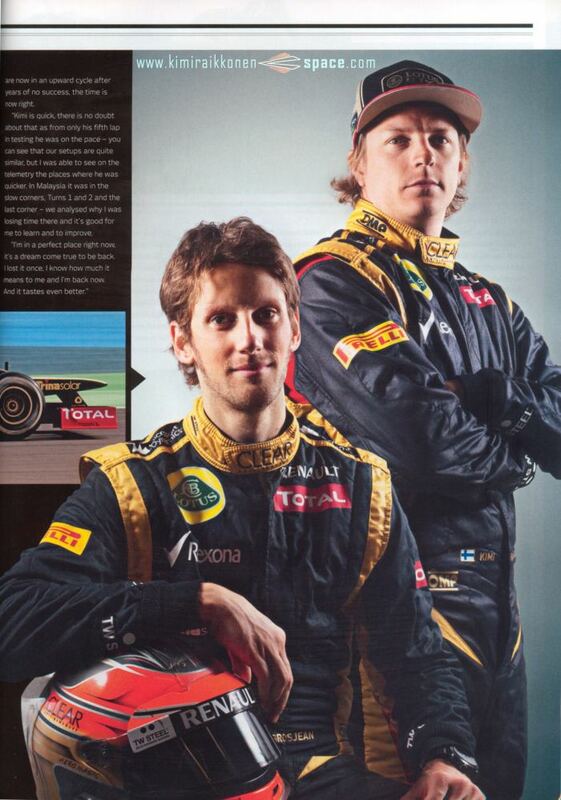 I have decided to trust Lotus F1 Team and that is why I joined the team. I’m not surprised by the performance – they are very professional, dedicated people there and I feel at home. I felt the potential of our car, while I tested it for the first time in Jerez. The boys in Enstone have always been able to build competitive cars, so it’s not such a surprise. How different is Formula One in 2012 compared to when you left it in 2009? Nothing has changed, it’s the same as before – some rules have evolved, I had KERS three years ago, but now there are DRS and the Pirelli tyres etc but nothing is different. Racing is still done in the same way. The quickest usually wins. 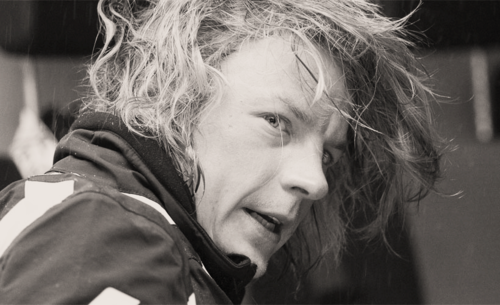 MTV3 reporter Mika Salo considers Kimis actions about demanding the steering changes is completely right thing to do. 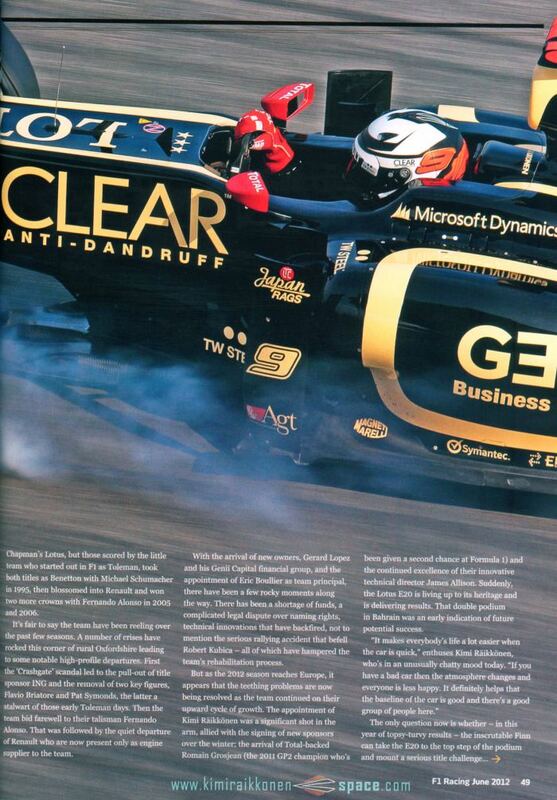 The steering of the Lotus car hasnt been quite there as Räikkönen has wished. 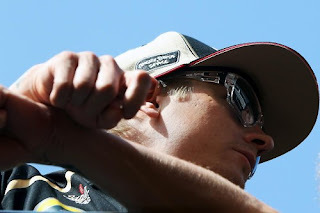 The latest time Kimi demanded changes to his steering was at the first practise of Monaco gp.Sky Sport was stirring the pot at the beginning of this week as they claimed on their site Lotus employees are already thingking Räikkönen should just adapt to the steering Lotus has. -Ofcourse Kimi have to demand the changes so he gets the feeling to his car he needs.You cant drive on the limit otherwise. Its perfectly normal for driver to demand the changes to his car from the team. 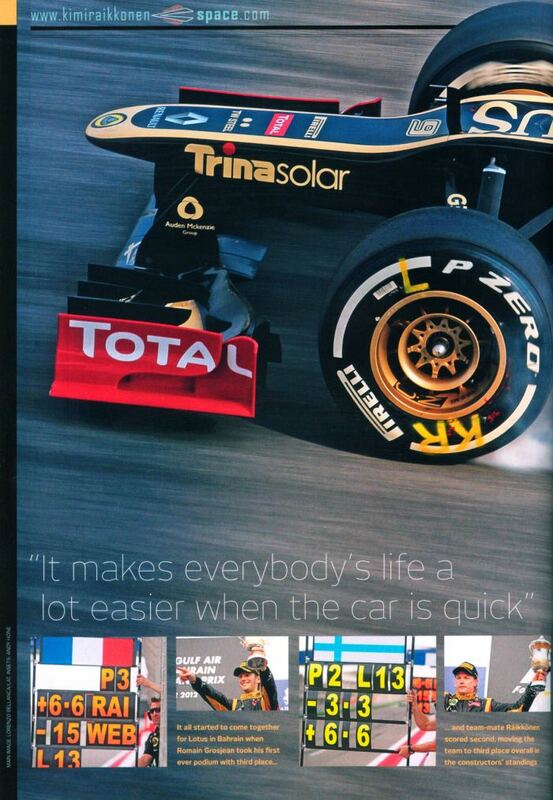 Big teams are capable to make a totally new car if needed even in the middle of the season but Lotus cant do it. Salo says. Salo reminds Kimi wasnt able to influence to this years cars desing in any way because he came to the team for this season. -Current car has been constructed by the feedback of last seasons drivers, Petrov and Senna. There hasnt been influence of Kimi what so ever. The more Kimi demands the changes the more the team understands the issue and make changes to next years car at least.Salo says. Salo knows by the experience of his own how drivers have to drive the car the previous drivers have developed. -When Kimi came to Sauber he had to drive the car I had developed. And when I went to Sauber , it was a dreadfull car to drive as Alesi had three pedals because he didnt want to brake with the left foot. Salo recalls. Kimi Raikkonen hasn't missed Formula 1 in his two-year break - and yet the Finn enjoys his comeback tour. "From current perspective, I am exactly at the right place," the 32-year-old said in an interview with German Press Agency in Monte Carlo. But family plans the 2007 World Champion has postponed for the time being. "I would like to become a father. 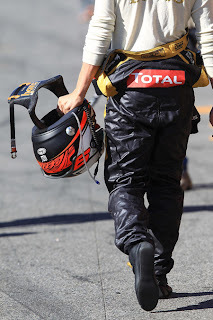 But at the moment it is not the right time, as long as I'm racing," said the Lotus driver. Your team principal has said, it was a risk to sign you. Was it like that also in your view? Raikkonen: "I had a few options. With the other teams we have not found a way to agree on a contract. Then we talked with Lotus. We got along well in many points, then it's gone very quickly. From the current perspective, I am exactly at the right place. " What stands out at Lotus in comparison to your previous employers in F1 such as Ferrari and McLaren? Raikkonen: "Every team has its own charcter. Italian teams are different than English. Although McLaren is also an English team like Lotus, but is managed quite differently. At Lotus, people just want to go racing, the atmosphere is good. It is still a very big team, but the feeling is different. People are quite relaxed, very open. All teams are different, but in the end they want to achieve the same. There are simply many ways to it. I'm happy where I am. " Lotus let you be more yourself? 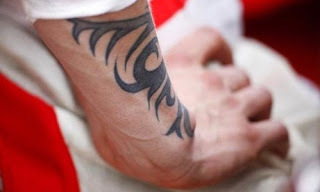 Raikkonen: "I try to live my life the way I want. Sometimes people make it hard for you. Here I can do my own thing, live a normal life like other people too. I do my job as always. I expect a few things from the team, they expect certain things from me. 24 hours I don't have to work here. " How important is this freedom for you? 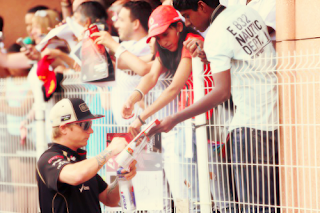 Raikkonen: "That is important for everyone. If you get put in jail, nobody is happy. The important thing is simply that I am happy with what I do. " Did you expect to drive at the top so soon after your comeback again? 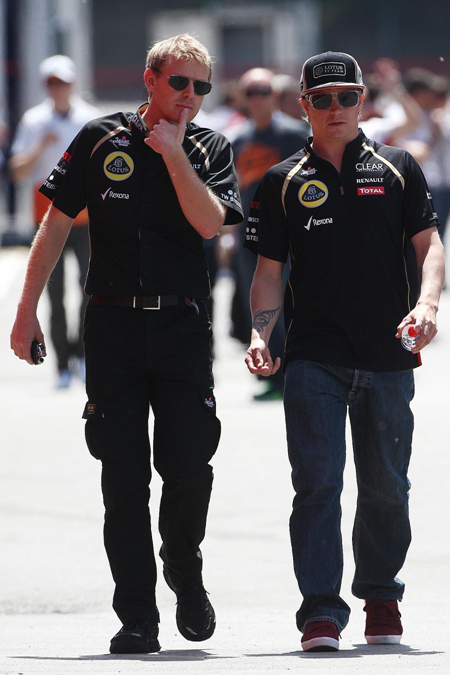 Raikkonen: "If you go to one of the last three teams, one knows to 110 percent that it will not work. To be in a good team, it's a lot easier. Lotus is strong, they were already strong, when I raced against them. There are still the same people there. When they do everything right, you know that you will be at the front. " Do you see yourself as a real title contender because of the tight field? 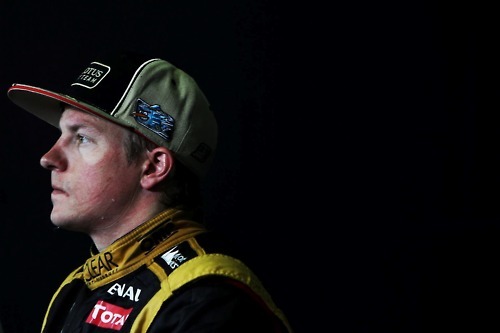 Raikkonen: "The season is still so long. We are far from being a top team. We do not have all the opportunities that have the big teams. We have some good plans. So far we have managed to improve the car. Whether I can fight at the front until the end, I do not know. If we continue like this, we might have a chance. " How have you changed in the two years of Formula 1 break? Raikkonen: "I do not think I've changed. Of course you get older. Things in life change. But my driving style is still the same. I do not work differently than before. Sometimes with more success, sometimes just with less. " Raikkonen: "There's a lot. I often like to just stay home and do nothing. And sometimes that bores me and I just go out. I like things such as motocross or snowmobile, anything with a motor. The speed makes it exciting. " Can you imagine to start a family soon? Raikkonen: "I would like to become a father. But at the moment it is not the right time, as long as I'm racing. The children are young only once, and then I would hardly see them because I'm never at home. Formula 1 is not the place for a family. I enjoy spending time with children, my brother has some. But for me the time has not come yet. " Do you think F1 has missed you in the past two years? 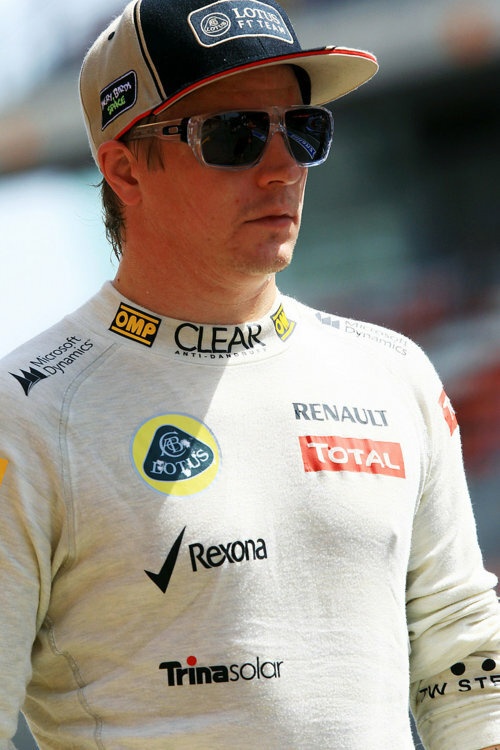 Raikkonen: "I don't know, I don't care. I have not missed it. I'm not here because I want to do someone a favor. 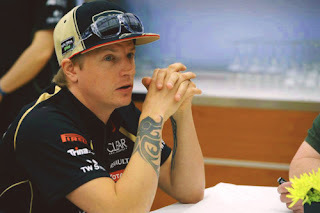 I do that for myself "
Raikkonen will not be allowed to take part in Rally Finland later this year, AUTOSPORT has learned, with his team bosses unwilling to release him from his commitments to the Lotus Formula 1 team. The former world champion had sought clearance to make a one-off return to the WRC, even though it is understood his F1 contract forbids him from taking part in rallying. However, following talks between Raikkonen and his boss Eric Boullier in Monaco, he was informed that the memory Robert Kubica's rally crash last year meant the team was not prepared to allow him to compete. 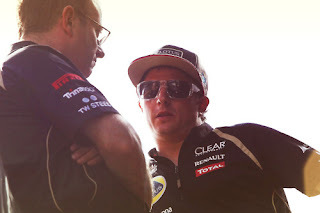 Boullier told AUTOSPORT: "I sat down with Kimi earlier today and we talked about it. 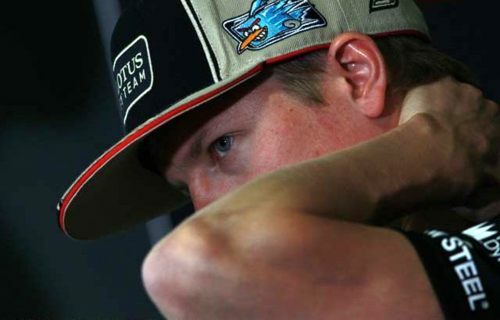 "His contract does not allow him to go rallying and, after what happened with Robert, this team could not let him do it. "He fully understands the situation, so the matter is closed now." Kubica was badly injured in an Italian rally crash in February last year, shortly after the first pre-season F1 test. His injuries forced him out for the season and there remain doubts about whether or not he will be able to make an F1 return. Raikkonen competed in the WRC in 2010 and '11 before deciding to come back to F1 for this season. Luviceman translated and summarized part of an article of a finnish magazine, interesting read. Thanks also to MomoD for sharing. 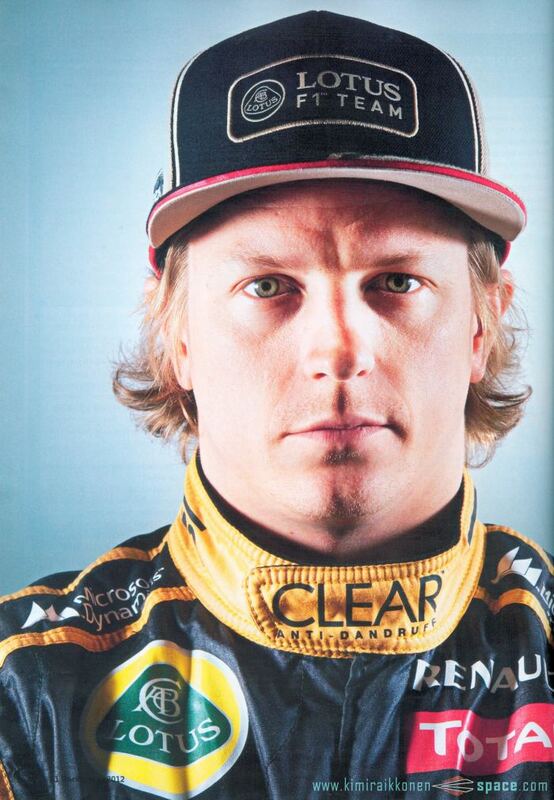 I think nobody knows real Kimi Raikkonen. He likes to joke and is talkative. Kaj said Kaj can't say since when he knew Kimi would return to F1, but Kimi didn't hide, but talked about the possibility to Kaj when he wanted to return to F1. And Kaj supported Kimi's decision. Also, Kaj said he really thinks it was really good time and experience for Kimi being in Rally for 2 years. "I saw Australian GP on TV. I was watching and thinking "*** No swearing *** he is really good at passing. I could not see whole Malaysia GP because I flew from Italy to Finland. I was disappointed because I could not see whole race." What is the most impressive episode of Kimi ever when you fought for Rally? "I have lots of great memories. It was really fun to fight for Rally in high level with him. At the end, Kimi has ended up his Rally carrier in 5th position in highest. Do you think he could do better? you can't succeed in Rally easily. Even if you can drive F1 well, you can't drive and control Rally car freely. Of course Kimi drove it well. there is no doubt about it, and he tremendously evolved in this two years. But winning is a different story." In what was he struggling the most? "A big difference between Rally and F1 is pace notes, the driver has to make pace notes by himself, and to push hard, you have to trust your pace note 100%. 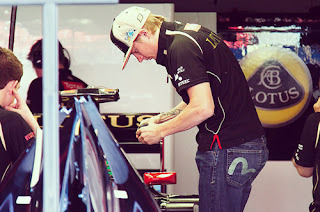 Kimi's notes had really evolved and although it was sometimes, he showed me his reckless speed. If only he continued...that I think." "I saw Kimi was a real professional in Rally field as well. When he didn't quite satisfy his time in special stage, he kept silence in the *** No swearing ****pit and thought about it. He continued analyzing 'how I can drive faster?' Not for fun/pleasure, he addressed Rally directly and seriously. From a fragment of his attitude and the communication, I always felt it." 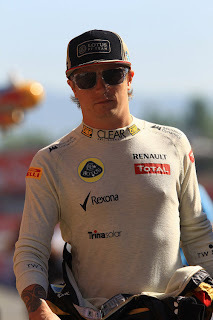 Does Kimi change in the job and in private? 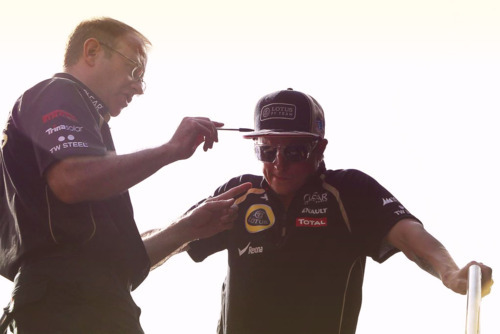 "Of course it's a part, but there are two different Kimi. When he works, he is at work mode, and when in private time, he is in free man mode. But I think the media doesn't know both Kimis. Work mode Kimi is only in the *** No swearing ****pit. So I think nobody really knows about real Kimi. I think nobody knows even 1% of Kimi." 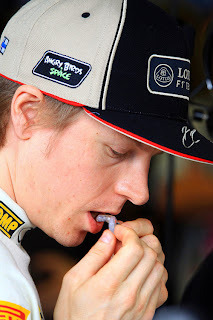 In private time, is Kimi an easy person to live with? "He is very fun to be around. I think he is really attractive guy. He loves jokes and is talkative. it was really fun to do long plane rides and work with him in Rally week. He is really serious at work. The media created an image and Kimi created another image in front of the media that are not a real Kimi. He is really normal guy in ordinary, he is not different than people around there." came here" every time in Finland. 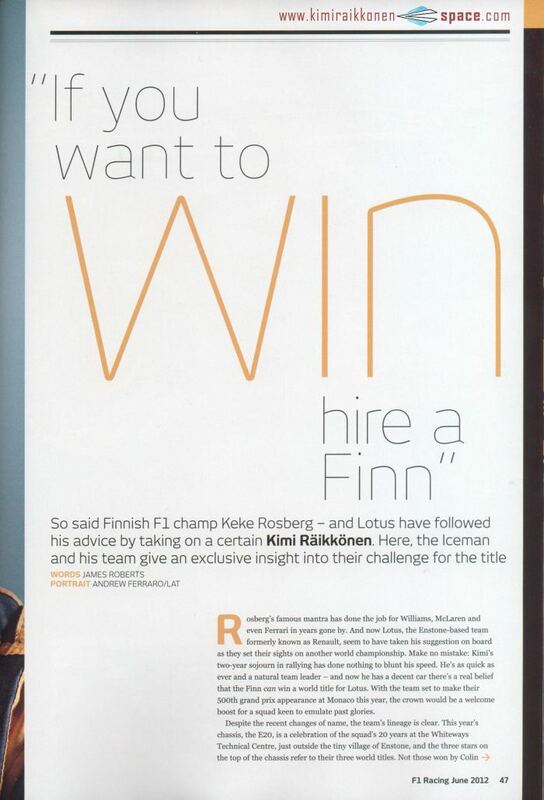 Is Kimi interested in what the media writes? influenced by anything. I think he let the media write whatever they want." Why does Kimi take a distance from the media and is cold to them? "The possibility is not zero, he likes Rally like that, he will do it as hobby in any way. blank, he could be much faster. 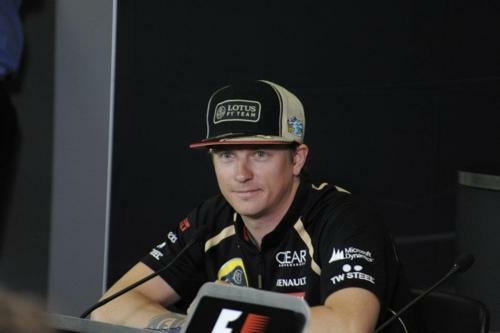 I strongly believe Kimi is the man who will be on the podium after his rehab, no...who shows wining." 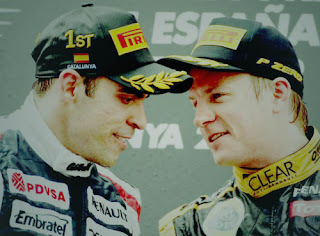 "I talked to Kimi a lot in 2011 because we are both privater of citroen. Kimi didn't have his hospitality for his team, so he always came to my team's hospitality and stayed relaxed. he make coffee, eat snack and really relaxed. even if the guests come, even if the media comes and taking pictures of him, he really didn't care about it but spent his time in his space. we often joked and laughing so hard. 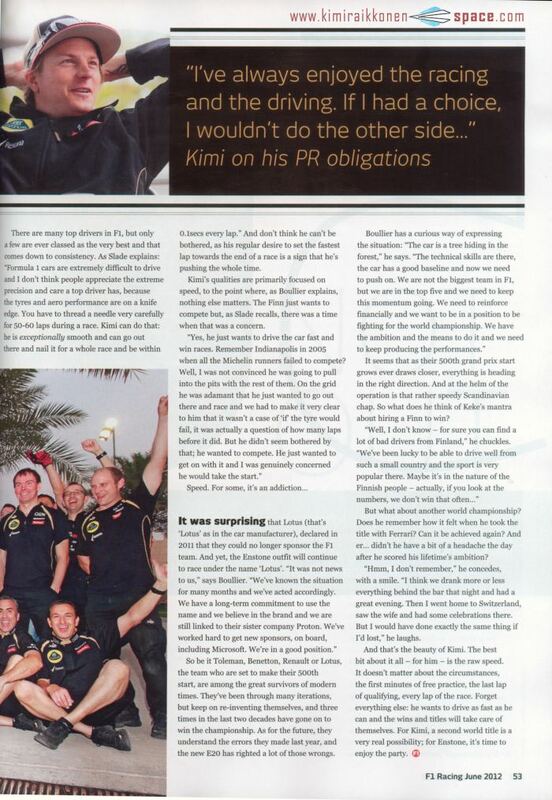 Kimi was not a guy who was said difficult/moody guy or weird guy. He is just a normal guy next door. Of course his talent of driver was not usual, and his attitude to Rally was really serious. I think if he continued, he could fight for win in near future. I welcome him back to WRC if he is away from F1." 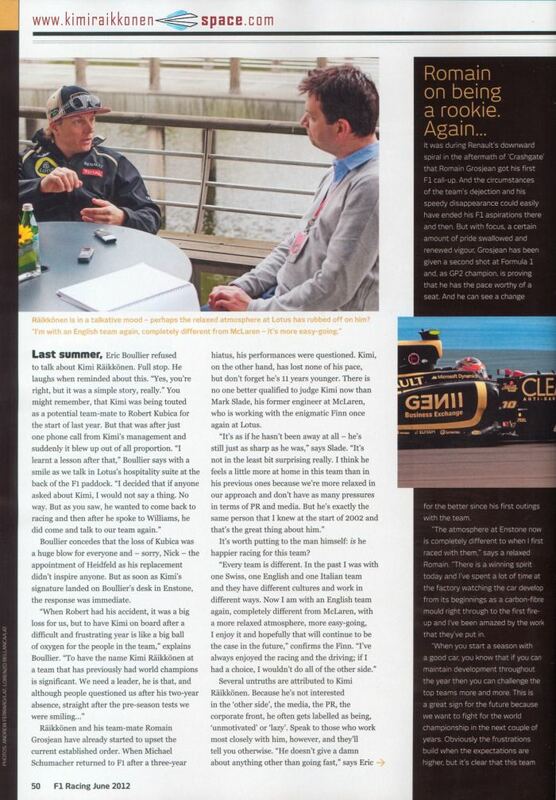 according to the article, a half year past after Kimi started his rally carrier in 2010, RB offered RB seat in 2011 to Kimi. this was before they spoke to Webber to extend his contract. but Kimi decided not to come back to F1. and it mentioned reason is unknown, but Kimi and RB sponsorship ended. WHY DO YOU ALWAYS WEAR A CAP AND SUNGLASSES, EVEN WHEN THERE IS NO SUN? KR: I like caps and I like sunglasses. I have very sensitive eyes so I have to protect them with the sunglasses. NOÉMI KOVÁCS: HAVE YOU EVER GOT SOMETHING SPECIAL FROM YOUR FANS? KR: I receive a lot of gifts from fans… they can be really inventive and it makes me smile. They remember my birthday, they send their congratulations and their supporting slogans in Finnish. That’s something special, isn’t it? WHY YOU DON’T HAVE A TWITTER ACCOUNT? KR: Well, I don’t really like twitter... or facebook. I prefer privacy. 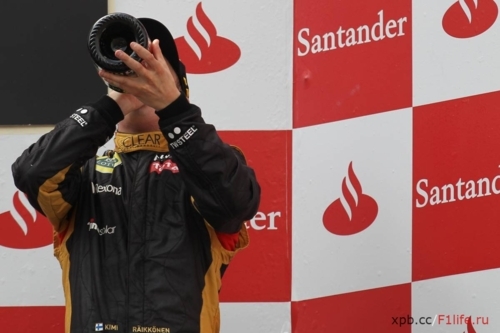 CINDY IDIER: WHAT WILL BE YOUR REVENGE AGAINST SEBASTIAN VETTEL AFTER WHAT HE DID ON THE PODIUM? DID YOU SEE THE PICTURES? KR: Yeah I saw that, it was funny. The revenge will come soon enough, I hope! Getting on the first step of the podium would be a good start. LISA MUNRO: WHO’S BETTER AT BADMINTON, YOU OR SEBASTIAN VETTEL? WHAT IS YOUR FAVOURITE ACTIVITY OUTSIDE OF FORMULA 1? KR: I like a lot of things… all kinds of sports and games where there is an element of competition. Ice Hockey is my current favourite while it’s still time for winter sports. KR: I think it’s more exciting if you have to battle and take some risks to obtain the top spot. I’m here to win! : WHAT SITUATION MAKES YOU NERVOUS ON THE RACE TRACK? KR: If somebody is doing something really stupid. But luckily right now the grid is very talented! DIVINE Y. LOPEZ: YOU’RE ALWAYS SO CALM AND COLLECTED. HOW DO YOU DO MANAGE THAT BEING INVOLVED IN A SPORTS THAT’S, TO MY MIND, FREQUENTLY TENSION-FILLED AND HIGHLY STRESSFUL? KR: I just focus on racing and don’t let other things bother me. I have been in racing for two thirds of my life now; you just get used to being in this environment. SARAH MOREAU: CAN YOU EXPLAIN WHY YOU ALWAYS PERFORM SO WELL AT SPA? KR: I really like the track so I guess that helps. I’m looking forward to racing there again and hopefully come home with a good result for the team. Over the course of the Bahrain Grand Prix weekend, Lotus F1 Team invited fans to ask their questions to Kimi via the official team website. Part 1 sees the Finn answer the first half of the best queries we received, including his thoughts on driving styles, team-mates, first cars, helmets and of course… ice-cream! WHAT ICE CREAM FLAVOUR DO YOU LIKE MOST? KR: [smiles] There is no specific flavour… vanilla, chocolate, strawberry the traditional Finnish ice cream flavour – whatever is available. HOW DO YOU RELAX AFTER A RACE? KR: I like to chill out with my close friends. Sometimes, I have a couple of my Finnish mates with me in the paddock and I like it a lot. It’s just nice to chat with them in Finnish, to think about something else than racing. MICHAEL KEARNS: WHAT WAS YOUR FIRST CAR AND WHAT DO YOU HAVE IN THE GARAGE THESE DAYS? HAVE YOU STILL GOT THE ENZO? KR: It was a Lada, a used one. I had good fun with it. I haven’t got the Enzo anymore but I have a nice Lotus Evoras S, which is a really good compromise. TANIA DHALIWAL: WHAT KIND OF MUSIC DO YOU LISTEN TO AND WHO IS YOUR FAVOURITE SINGER / BAND? KR: Most of all I like the music the Finns play. I also like Linkin Park, I think they’re cool. DO YOU THINK A HAT TRICK (POLE + WIN + FASTEST LAP) COULD BE POSSIBLE IN THE E20? IF SO, AT WHICH CIRCUIT WILL IT BE? KR: That would be nice! After our performance in Bahrain, I know that we can do even better. The win was very, very close. We’ll have to see at which circuit that will be… but keep in mind, you don’t gain any extra points for poles and fastest lap times! VINAY POTHNIS: HOW WOULD YOU KNOW IF YOU HAVE DONE A PERFECT LAP? KR: There is not a perfect lap, only in dreams. You can get a great lap without any mistakes, but you can always improve it, believe me! VINAY POTHNIS: HOW DO YOU IMPROVE ON A LAP BY LAP BASIS IN A RACE? KR: With brand new tyres, you always go faster compared to used ones. Also, the car gets lighter and lighter in the race. While the new tyre drops off, there is no way you can improve your times after a few laps. Normally, you improve the time with the right timing of pits stops and then burning the fuel so the car gets lighter all the time to the Finish. WE LEARNED THAT YOU ARE A BIT MORE HARSH ON THE ENGINE THEN ROMAIN. IN WHICH WAY DOES THAT AFFECT THE CAR? FURTHERMORE, HOW DO YOU LIKE THE ENGINE TO PICK-UP REGARDING YOUR USE OF THE THROTTLE? 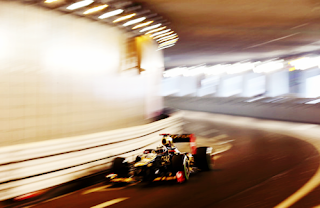 KR: I have driven the car and used the throttle in the same way all my career. Every driver has his own style of going fast. This is mine. It is maybe a bit harsh, but it remains within the scope of what the Renault engine can take. HORVÁTH LEVENTE: WHAT’S THE RED MOTIF ON YOUR HELMET AND WHAT DOES IT SYMBOLIZE? KR: There is the number 9 in red as that’s my number in the championship. But the helmet design is just a design, it is not trying to symbolize anything special. I like to change the design each year. So it’s easy to remember afterwards which season relates to which helmet. HORVÁTH LEVENTE: WHO HAS BEEN THE STRONGEST TEAM-MATE IN YOUR F1 CAREER? KR: Almost of all of them have been very competitive! But I never focus on them, I just concentrate on my own doings with my crew. That’s the only way to beat them and the rest of the field. The book is called 'EVVVK - Kimi Räikkösen parhaat' ("Could Not Interest Me Any F***ing Less" - The Best of Kimi Raikkonen). It's a compilation of Kimi's best interview answers and comments. The book is written in Finnish and will be out on the 30th of June. Mark Priestley, former McLaren mechanic. - Paula Raikkonen, Kimi’s mother. Q: You beat Sebastian all the time in Badminton. Doesn’t he want to play something else? Q: Does he beat you at least there? KR: No, of course not! At least I still beat him off track this year. Q: Is it true that you moved nearby him? KR: I moved, but not to be close to him (grins) But now we are just 10 minutes away. Before it was 25. Now I can beat him more often in Badminton. Q: Is there a question you have never been asked that you would like to talk about? Kimi Raikkonen: No. I like to be quiet. 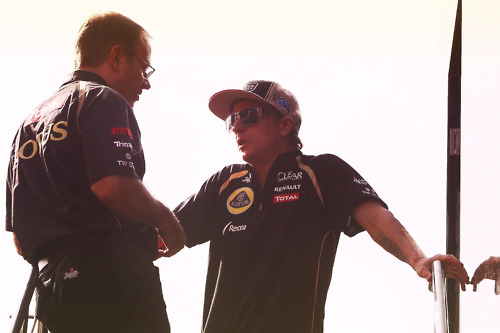 Q: Has it something to do with Lotus team principal Eric Boullier calling you a ‘wild animal’ that needs to ‘run free’? The ‘don’t fence me in’ character? Q: What is it that is still standing between you and a victory for Lotus? 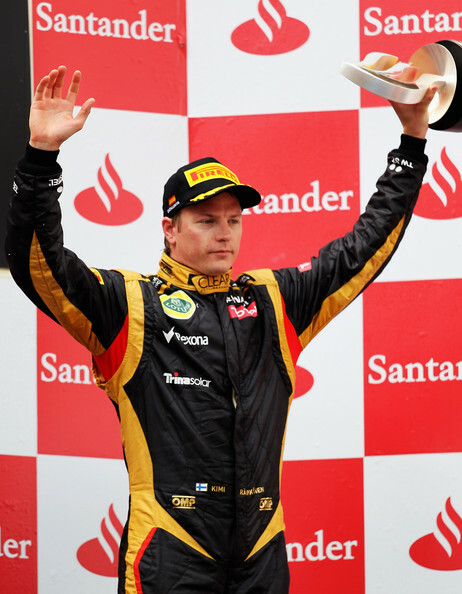 Kimi Räikkönen gets as the second Finnish driver his own badge of honor on the Champions' alley on Spain's GP-track. Räikkönen has won Spain's GP twice in years 2005 and 2008. The badge of honor with Finnish aphorisms will be revealed on Saturday. Like Räikkönen, Mika Häkkinen has already earlier redeemed his own place of honor from the Champions' alley after winning Spain's GP three times in a row in 1998-2000 and even led the fourth GP to the last lap. Räikkönen followed the WC icehockey-game Finland-Switzerland on Tuesday in Helsinki. On Wednesday he flew to his own F1-busies and will be one of the strongest winner candidates when Lotus oozes competitiveness on a track like Barcelona, which is aerodynamically demanding. The Iceman, back in the Formula One paddock, hasn’t exactly melted – he’s way too cool for that – but he’s got a smile on his face a bit more often than we saw during his final year of rallying in particular. In fact, fresh off the back of a podium at the Bahrain Grand Prix, Kimi is already talking about adding to his total of 18 grand prix wins. 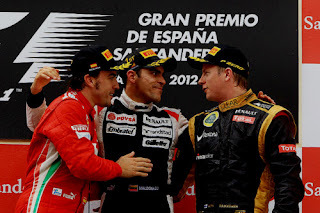 Reigning champion Sebastian Vettel, for one, is convinced that Kimi will soon be a winner again. He should know, because he came very close to being passed by a black and gold missile that came from out of nowhere in the closing stages of Bahrain. Kimi had one chance, took it, but backed off when it was all getting a bit too hairy. As always, fast but fair. Having previously been linked with Williams at the end of last year, Kimi’s management team knew exactly what they were doing when they plumped for the re-born Lotus team instead. 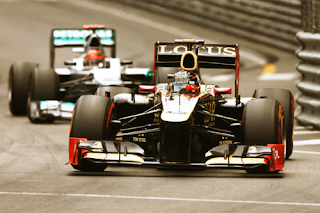 Lotus isn’t quite in the big three yet – but it’s definitely best of the rest. And the only missing link was an established world champion, which they now have. But Kimi’s performance in Formula One now is no less impressive than his first year in rallying, even though it didn’t net any podiums. It’s just that Formula One is where he inevitably has the most experience, which is why he’s not too surprised by his front-running pace again. With PR sensitivities in Formula One as they are, Kimi would never be allowed to admit this, but he almost certainly believes that he’s been driving better over the last couple of years in a rally car than he has for the last couple of months in a Formula One car. Currently Kimi is seventh in the Formula One standings, just one point behind Chinese Grand Prix winner Nico Rosberg and 19 points – less than a win, remember – behind championship leader Vettel. 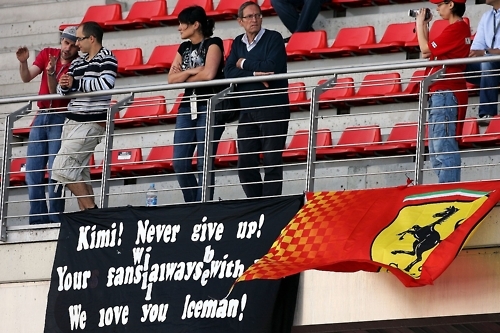 Just four races into his F1 comeback and Kimi stood on the second step of the podium. The Iceman however was not completely happy; after all, the victory was so nearly in his grasp. Will Barcelona give him the opportunity to add to his win tally? 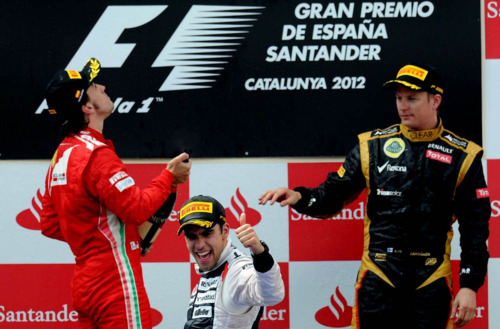 IT TOOK YOU FOUR RACES INTO YOUR COMEBACK BEFORE YOU ACHIEVED A PODIUM – WERE YOU SURPRISED AT THIS? I never had any doubts in myself and it is clear we have a good car so in some ways the podium could have come sooner. We had the car already in the first three races to be up there, but we made some small mistakes and it cost us a lot. I would have been much happier if we had managed to get the victory, but nevertheless it’s a good result and the team deserved it for all their hard work. 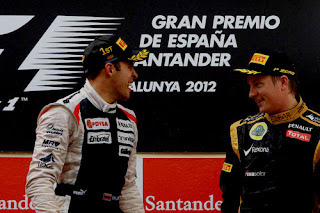 We have been good in every race so far, so hopefully we will be regular visitors to the podium this season. ARE YOU FRUSTRATED NOT TO HAVE TAKEN THE WIN? I chose the wrong side to make it past Sebastian (Vettel). I didn’t make it past and after that, I pretty much knew that was it. Of course, I wanted to win. I would have been much happier with myself after the race. YOU DID NOT ATTEND THE MUGELLO TEST – IS THIS AN ISSUE FOR YOU? We didn’t have any major new parts to test and we don’t race at Mugello so I was not crying when it was decided that I wouldn’t test. I know the track well but there was no need for me to drive. I am here to race and that is what I will do in Barcelona. YOU MUST HAVE COMPLETED A LOT OF LAPS OF THE CIRCUIT DE CATALUNYA OVER THE YEARS; WHAT ARE YOUR THOUGHTS OF THE TRACK? I have tested there very many times. It’s a challenging circuit - great fun with a good car, but not that great with a not so good car. Usually a car going well in Barcelona, goes well everywhere. We had a good car there for the second pre-season test even if the car wasn’t quite together for the first one.The car has improved and I feel more comfortable in it. WHAT ARE YOUR THOUGHTS ON THE PIRELLI TYRES AND THE STRATEGIES NEEDED FOR THE BEST RESULTS? No matter what the tyres you always have to make a strategy to suit them best. The tyres are fine for me. For the strategy I work with my engineers and we make the best choices we can. Sometimes we get it right, like in Bahrain. Sometimes we get very close, like in Shanghai. After the race in China and after the qualifying in Bahrain, people probably started thinking that we are idiots and cannot do anything right. But we showed in the race why we did what we did. It was close already in China and this time our strategy paid back very nicely for us. It’s all part of racing and the same for everyone. ARE YOU LOOKING FORWARD TO RACING IN EUROPE AGAIN? I really like racing in Europe. We don’t have to travel too far and all the energy is saved for the weekend itself. Traditionally the real season starts while coming back to Europe. For me it’s just great. WHAT DO YOU THINK CAN BE ACHIEVED IN THE SPANISH GRAND PRIX? 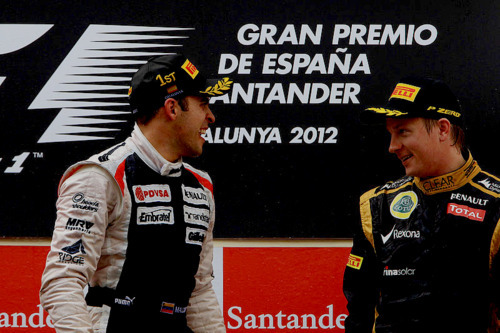 I expect Lotus to be very competitive at Barcelona. It’s going to be very, very close between the top teams. This is the only circuit where the teams have already tested with the new cars, and the set up is crucial as the track changes with the wind and temperature. All the teams have updates for the first European race, which makes it even more interesting and even tighter at the top. 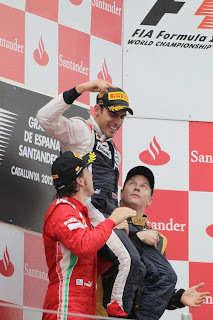 YOU HAVE SOME GOOD MEMORIES OF THE SPANISH GRAND PRIX? Yes, I have won there twice, and there’s nothing better than winning in any Grand Prix. Those two wins are my only podiums in the event. FOUR RACES COMPLETED; WHAT DO YOU WANT TO ACHIEVE FROM THE NEXT FOUR? Let’s see what happens. As I’ve said, the car feels good everywhere we’ve been so far. I am here to race and I race to win. That is the target for me and the team. We want to win Grands Prix. We have a good car and we saw in Bahrain it is good enough to win. That’s the target. Barcelona is the next stop on the Formula 1 calendar as the European phase of the season gets underway next weekend. Stay tuned to the official Lotus F1 Team website, Twitter feed and Facebook page for all the latest from Enstone as we look ahead to the Spanish Grand Prix. While the Bahrain Grand Prix is likely to be best remembered for events away from the track, it should go down as the race where Kimi Raikkonen re-emerged as a genuine Formula One contender. All sorts of question marks had been raised over the Finn's return to the top echelon of motorsport after spending the last two seasons in the World Rally Championship and a brief dalliance with NASCAR. But it has been clear to see from the outset that the 2007 world champion has settled back into Formula One with the relative comfort you would expect to see from such a talent, even if a series of misfortunes meant his results for Lotus did not immediately suggest it. At the opening round in Australia there was instant encouragement with a fine seventh place in opening practice. A communication issue during qualifying restricted him to 18th on the grid, but his reputation as one of the great overtakers remained intact as he stormed through to finish seventh in his first race on Pirelli tyres. In Malaysia, Raikkonen qualified an impressive fifth, only for a gearbox change to see him handed a five-place grid penalty. A fifth place finish in the race, which saw him use the Pirelli wet tyre for the first time, again suggested the Kimi of old was back. That was offset by disappointment in China as starting fourth on the grid was wasted as a gamble on making his final set of tyres last backfired, dropping him from second to an eventual 14th. But Bahrain was the clearest indicator yet that Raikkonen and Lotus are contenders for race wins and the world championship. The way Raikkonen pushed his way through from 11th to harass world champion Sebastian Vettel for the majority of the race, with only a cautious pit strategy denying him victory, was reminiscent of the best moments of his first Formula One stint, when on his day he was arguably the fastest driver on the grid. 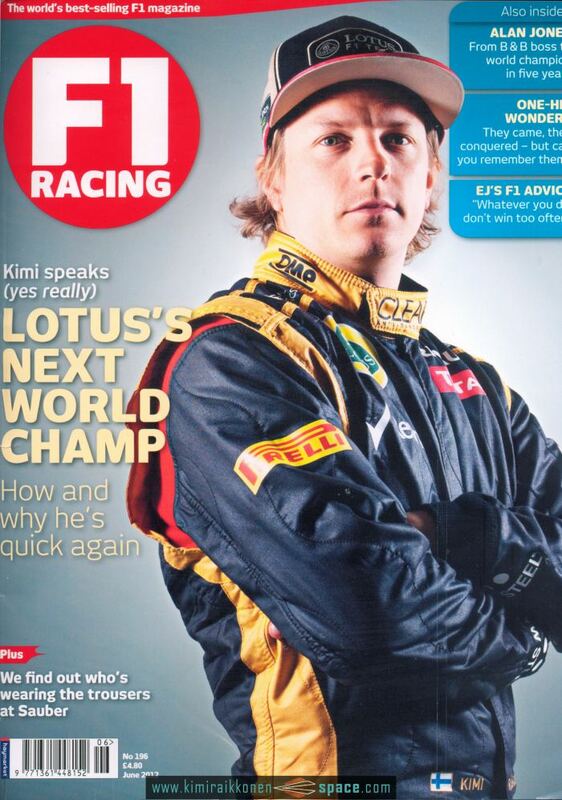 And there can be no question that as exciting as the 2010 and 2011 Formula One seasons were, Raikkonen was missed. The Finn's mixture of aggression, bravery and phenomenal speed were obvious from the moment Peter Sauber plucked him from the obscurity of Formula Renault to race for his team in 2001 at the age of just 21. Within a year Raikkonen was sat in a McLaren as replacement for another 'Flying Finn' Mika Hakkinen, and only poor reliability denied him title glory in 2003 and 2005, the latter season including his incredible drive from 17th on the grid to victory in Japan. While the likes of Fernando Alonso, currently hamstrung by Ferrari's lack of pace, Vettel and Lewis Hamilton are lauded as being the best drivers in the world, it is easy to forget that Raikkonen's abilities more than pass muster when compared to that trio. 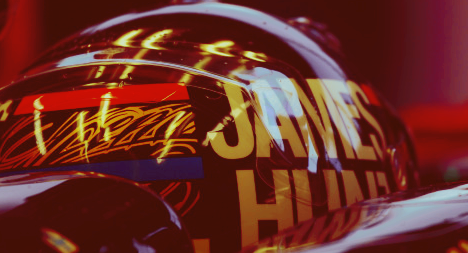 Arguably his finest hour came towards the end of his first season with Ferrari in 2007. Raikkonen had no margin for error heading into the final two races of the season in China and Brazil, needing to win them both to beat the McLarens of Alonso and Hamilton to the title. And he delivered with two peerless drives as the infighting Alonso and Hamilton let their eyes wander off the ball. It was Raikkonen who held his nerve. But the 32-year-old has often given the impression of being someone who could do without the sport. He is often monosyllabic and unresponsive when faced with questions from the media, and is similarly unenthusiastic about dealing with sponsors. His disillusionment and a lack of consistent results in 2008 and 2009 led to his move away from the sport, but thankfully he is back and showing that the fire still burns. Vettel, Hamilton and Alonso have been warned. 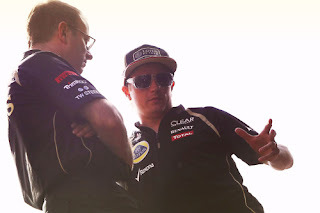 Lotus will bring the very best out of Kimi Raikkonen, reckon team bosses Eric Boullier and Gerard Lopez, who believe the 2007 world champion is a much more dedicated team player than his past reputation suggested. \"For most people it's probably one of the big mysteries, because you hear the hearsay and so forth, but we feel very good with him and he clearly feels at home,\" Lopez told Autosport. \"He smiles a lot when he's with us! But most importantly that says he feels more like part of the family.\"
Lopez added: \"I think Kimi has a public image that honestly from what we've seen does not translate into how he really is. He's a very hard worker, very good at providing feedback, and has a good team spirit. \"Once we talked to him, once we understood why he was coming back, we really felt comfortable. If you look at what happened [at the test], nobody can say that he's not on the pace.\"
Boullier reckons the way Lotus works is proving ideal for Raikkonen.